It took a generation or two for film cameras to give way to digital. It’s only taking a year or two for cameras to give way to cellphones and tablets as our primary way of taking pictures! We just recorded a video for our members on how to use Dropbox to get pictures from any phone or tablet to your computer. And then, we get emails asking specifically about how to use iCloud to get photos from phones and tablets to your computer. Since I have been taking pictures with my iPad, I have actually figured out how it works, so here goes! 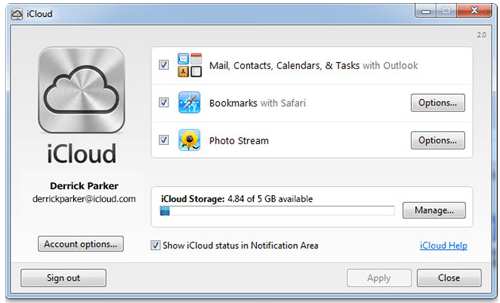 iCloud is Apple’s cloud storage and synchronizing software. If you’ve ever attended our Cloud Computing seminar , you learned that iCloud is Apple’s competitor to Dropbox, Microsoft SkyDrive, and Google Drive. Of these four, we like Dropbox the best, primarily because it is NOT one of the big three: Microsoft, Google or Apple. That means it works with everything, and it works well! But, I digress, this article is supposed to be about iCloud. Since it’s Apple, you must have an AppleID to use it. If you have an iPhone or iPad, you already know your AppleID right? OK, on your iPad/iPhone, check your iCloud settings. Every possible set of data that can be synchronized will show up there. We’re focusing on photos, so make sure the Photo Stream setting is set to ON. 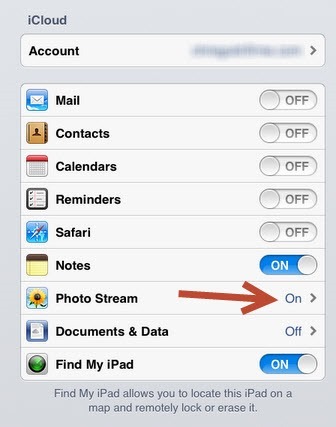 Now that the iCloud Photo Stream setting is ON for the device where you’re taking the photos, next you need to have iCloud set up on the computer where you want to receive the photos. So, on your Windows PC, you need to go to Apple’s iCloud setup website and click on ‘For PC.’ This will download the iCloud software, aka the Control Panel, to your computer. A very important setting on this Control Panel is the options for Photo Stream. 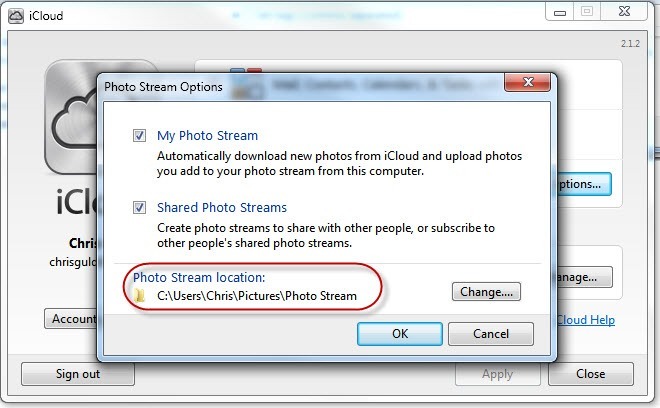 If you specify a Photo Stream location that is a folder under your Pictures folder, that means it will automatically be in Picasa’s view! When I take a picture with my iPad, that picture will be viewable in Picasa! That is, IF both the iPad and my computer both have a decent Internet connection. Pretty cool. One thing that doesn’t quite make sense to me though is that, if I log into my iCloud.com account, I don’t see my pictures there. I’m accustomed to ‘Cloud Storage and Synchronizing’ meaning that my stuff is in at least 3 places: 1. the originating device (e.g. iPad) 2. the destination device (e.g. PC) AND 3. the Cloud account (e.g. www.cloud.com) But, when I visit www.cloud.com and login with my AppleID and password, I don’t see any place to view photos. If anyone has different experience, please leave a comment ok? For more info, see Apple’s FAQ on iCloud Photo Stream. Published by MrsGeek, in Blog. Tagged with Apple iCloud, Synchronizing pictures from iPad to PC. We had a similar experience with iCloud. We even purchased extra capacity to handle our photos. We were told at Apple Store that icloud was not suitable for photo storage and we should use a service such as Dropbox.